How do I edit my petition? How do I change or add a picture? How do I see who's signed my petition, and what will that do? Will this end the campaign? Can I download it multiple times? How do I get more signatures? Start by sharing your petition with everyone you know. You can also ‘collect signatures on paper’ through the ‘Manage’ section. Then you’ll be able to print petition sheets and go to the high streets or around your neighbourhood to collect signatures in person. I don't have social media - how should I promote my petition? Social media is a great way to grow your petition – if you’re able to make a Facebook or Twitter account, that can be a big help! But if not – don’t worry. You can still email your friends, family, and colleagues about your petition or print off paper petition forms. Keep reading for top tips! How do I contact people who’ve signed my petition? How many emails can I send to the members who’ve signed my petition? You can send a maximum of 3 per week. Can 38 Degrees send my campaign out? It’s unlikely that this will happen. It really is 38 Degrees members who decide the issues we campaign on and which are emailed out to other members. 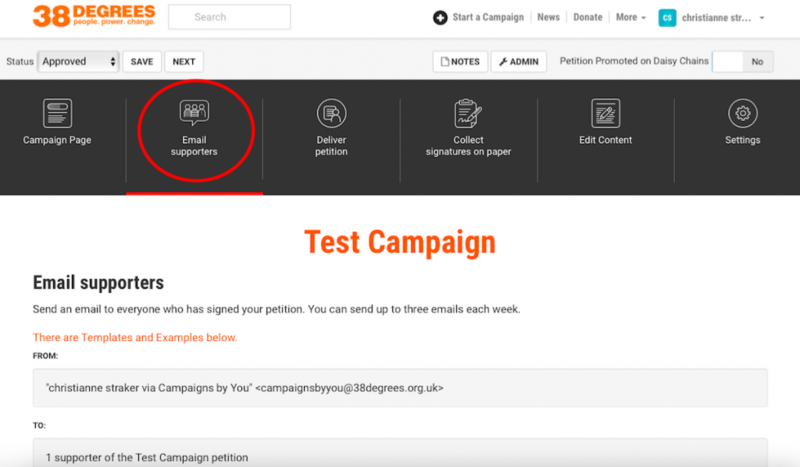 We get around 25 petitions a day set up on the website, and I’m sure the number of 38 Degrees members would quickly plummet if we sent out an email on every campaign. Why can my petition only have 100 signatures, and how do I change this? 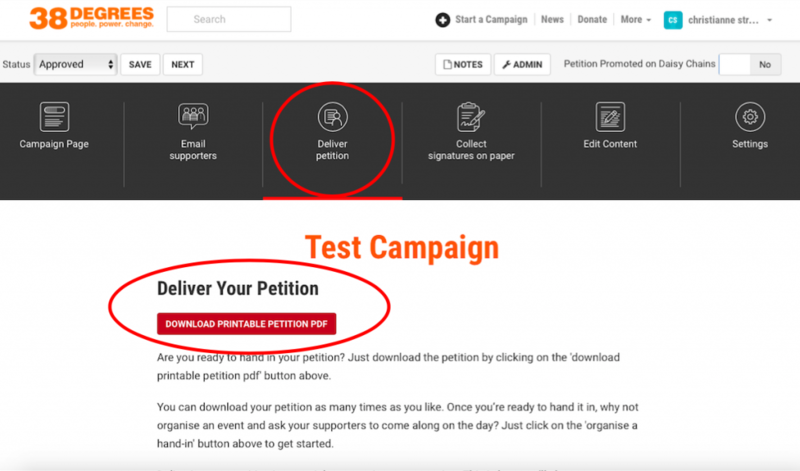 The signature counter will automatically update as your petition gets more signatures – so please don’t worry, there’s no cap on the number of signatures you can collect. What writing tips do you have for my petition? It’s great to keep the ask short and concise, provide links to helpful sources in the ‘why’ section, and address your petition to the correct target! Why can’t I tick all the categories? The office team limits the number of categories for each petition to the most relevant. This helps the categories to have a clear structure and meaning. 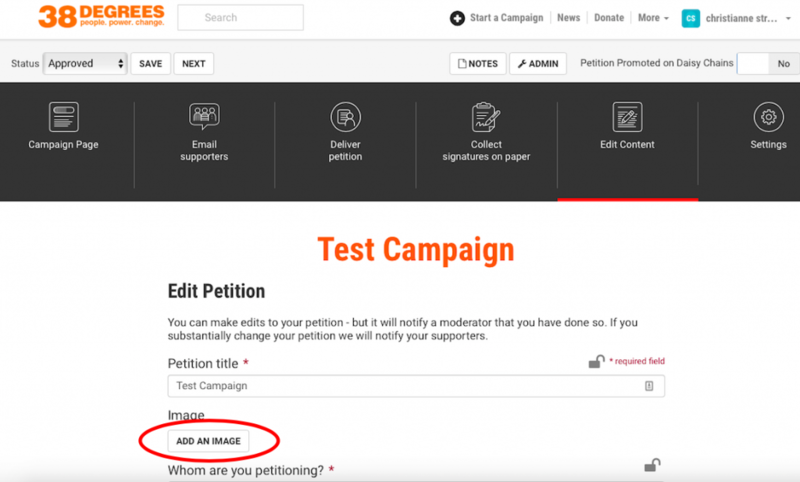 Why can’t I edit the ‘ask’ of my petition any more? 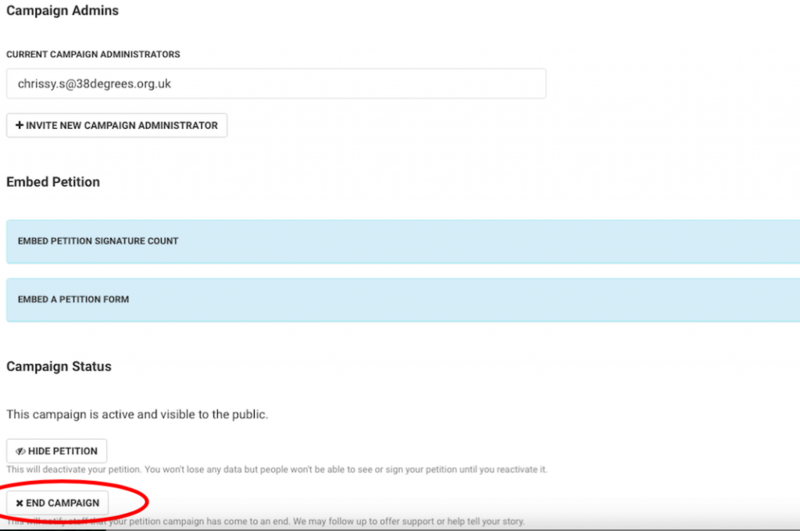 Once people have signed your petition you can’t change the ‘ask’ – this is because the people who’ve signed put their name to a certain ask and it wouldn’t be fair to change it afterwards! Can a petition have multiple admins? 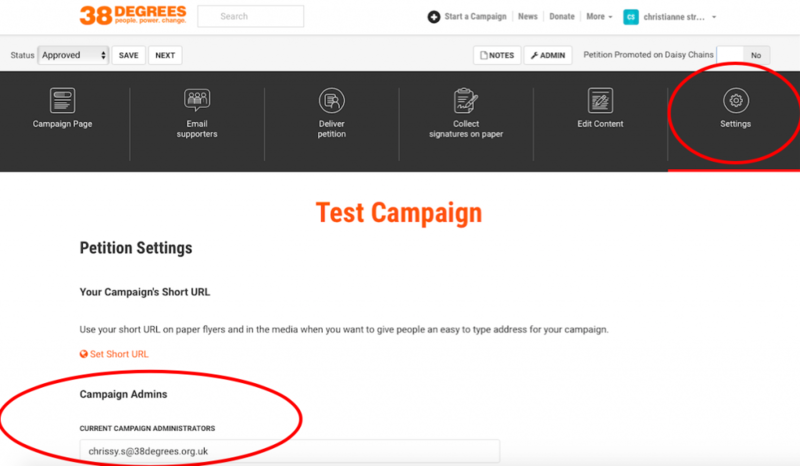 Why can't we find my campaign by searching for it on the site? Not every campaign will appear in the list of petitions on Campaigns by You. This is so the office team can highlight petitions that we think will particularly appeal to 38 Degrees members. Don’t worry though – petition pages are still live and open for people to sign even if they don’t appear in the list. And since almost all your signatures will come from people sharing your petition, whether or your petition appears in the list will not affect the success of your campaign. I'm going to hand-in my petition - should I end my petition? After you hand your petition in, it’s a good idea to keep your petition open. This way, you can get in touch with petition-signers to let them know what happens after the hand-in, and continue the campaign if you need to. I've won my campaign! What do I do? I've lost my campaign - what do I do? Keep campaigning – don’t give up! 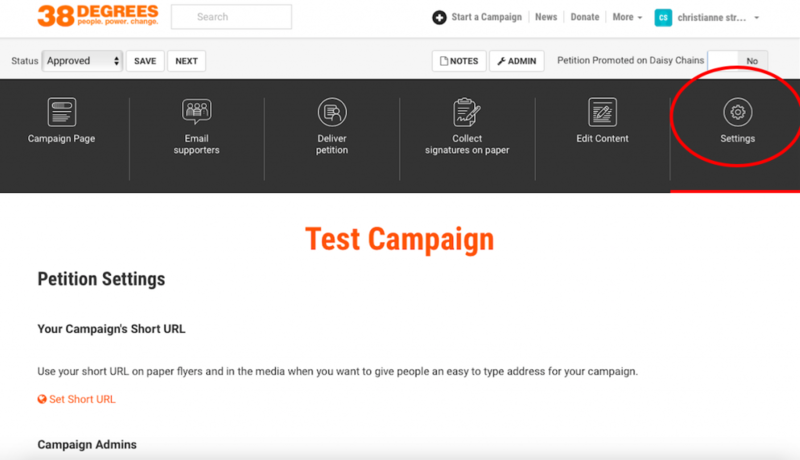 You can start a new petition, or look for new ways to keep your campaign going. How do I end my campaign? 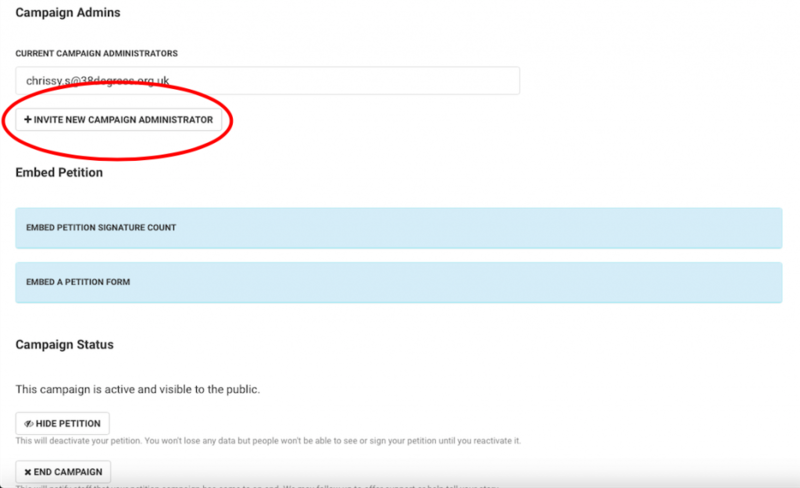 You can end your campaign under the “settings” tab above your petition.